Around 40 km from the main city of Agra stands the ephemeral capital of Emperor Akbar, the Fatehpur Sikri or the city of Victory. Built by Akbar in the 16th century, it is a beautiful city made in brilliant red coloured sand stone that was available around. The city is built on the ridge of a hill within 5 sq. km area, next to a lake which has now dried up. The rapid construction of the city is mysterious and equally mysterious is its desertion. It is said that Akbar decided to build a mosque for the Sufi saint Salim Chisti on the spot where it stands now, as a gesture of gratitude. Akbar did not have an heir to his kingdom and after the saint&apos;s prophecy he was blessed by three sons. As he started building the palaces, harems, courtyards, pools and places of public and private audience after the construction of the huge mosque and the tomb, his ministers too started building their houses around it; thus constructing a huge city within no time. But this beautiful city which was fully operational was deserted soon. The reason for desertion is not clear although it is said to be shortage of water in the royal palaces. Was it a whim of an emperor to build a city and then suddenly leave it or was it his unfulfilled dream, no one knows. 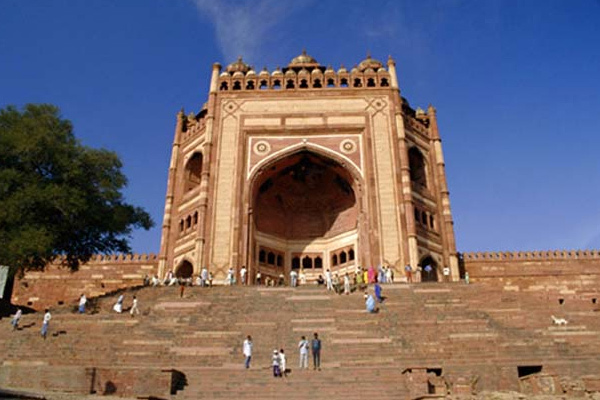 A huge gate, known as the Buland Darwaza a unique piece of Mughal architecture, of around 40 meters in height, was constructed after Akbar&apos;s victory over Gujarat, which probably gave the city its name of Fatehpur Sikri. The name Buland Darwaza suggests the invincibility of the Fort. 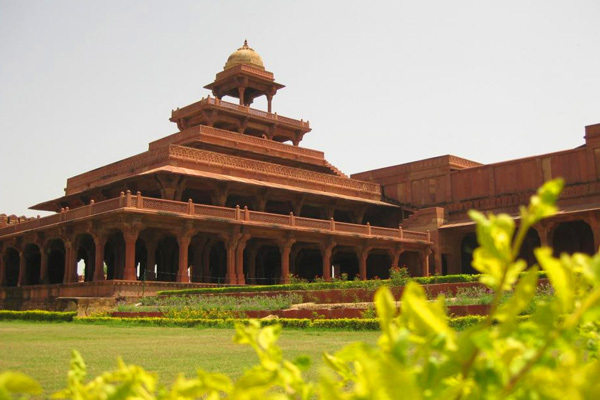 Fatehpur Sikri is the amalgamation of many architectural styles. Primarily used are the Gujarat and the Rajput kind of architectures in the construction of its various palaces. 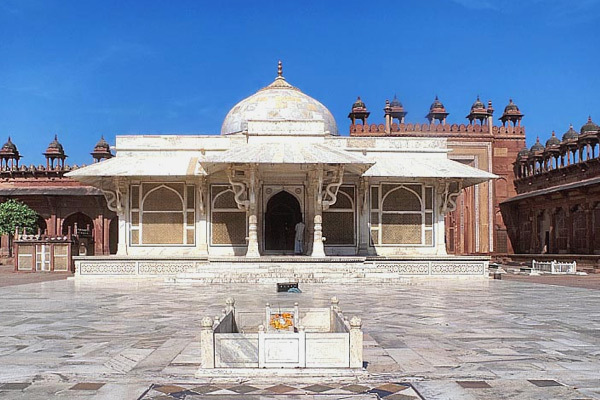 The Mosque and especially the tomb of Salim Chisti hold a lot of importance. It is said that if a devotee with whole heartedness prays on the tomb and ties a thread to the carved pane making a wish, his wish definitely gets fulfilled. One can see innumerous threads tied and visitors of all the religions coming over to fulfill their wishes. The other important structures on the campus are the Jodhabai Mahal, the Panch Mahal and the Birbal Mahal. 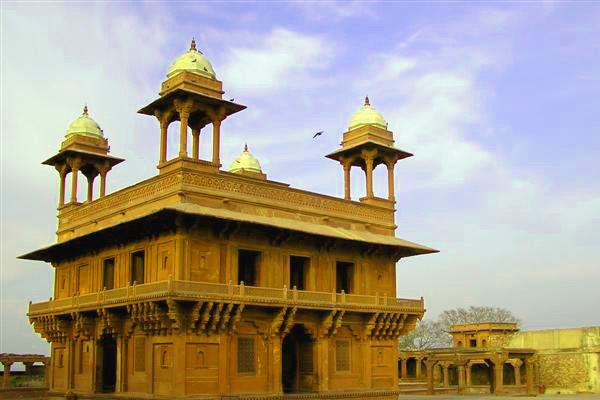 All have a distinctive quality of architecture which differs from the rest of the Mughal architecture built during that time. The city also known as the ghost city due to its mysterious abandonment holds a unique charm. Whatever may be the reason of the desertion of the city by the emperor, he definitely left behind one of the finest specimens of architecture of that era. 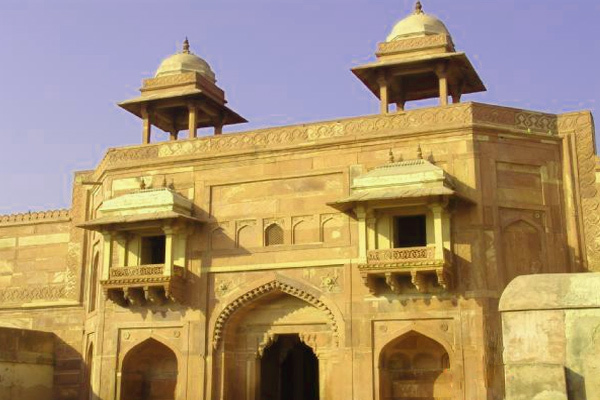 Approximately 40 kilometers from Agra, the erstwhile Mughal Capital. Fatehpur Sikri falls en-route to Jaipur, while traveling from Agra by road.